The Open Budget Index assigns countries covered by the International Budget Partnership’s Open Budget Survey a transparency score on a 100-point scale using 109 of the Survey’s 140 questions. These questions focus specifically on whether the government provides the public with timely access to comprehensive budget information based on the public availability and content of eight key budget documents that all governments should publish over the different stages of the budget cycle. A score of roughly 60 is considered to represent the level at which countries are publishing sufficient information to allow public discussions on the budget to occur. 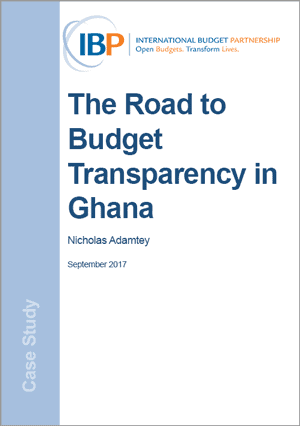 Ghana has been making some efforts toward improving budget transparency over the years by making some information and some budget documents available to the public. However, Ghana’s performance on the Open Budget Index has not shown much improvement. This case study examines Ghana’s efforts, with special emphasis on the period of 2008 to 2016. It also examines the issue of “volatility” (i.e., the inconsistent publication of government budget information from year to year) in Ghana’s performance.